Wat Umong is one of Chiang Mai’s hidden secrets. 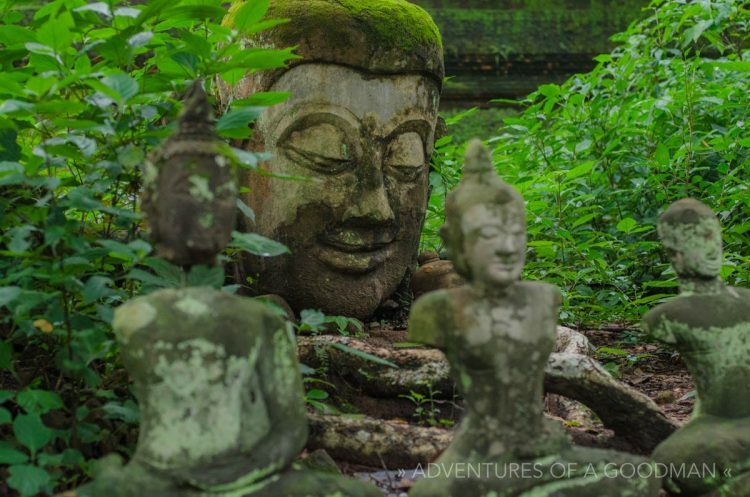 Located on the outskirts of the main city, this beautiful 700-year-oldBuddhist monastery is shrouded in trees, plants, partially-destroyed Buddha statues and monks. Wat Umong is home to this controversial Buddha statue — note the starving look with full ribs and veins showing. Wat Umong, also known as the forest monastery, is a beautifully shaded plot of land that monks visit during the day to pray, learn and meditate. It is most famous for a series of underground tunnels built hundreds of years ago to keep a wandering monk occupied and in one place. Above it is a large dagoba and a statue of an emaciated Buddha, complete with skinny rib cage and veins sticking out. The tunnels had healthy Buddha statues at every bend, complete with locals praying and very faded artwork adorning the ceiling. The Wat Umong meditation retreat story begins with a quest for two plain white tee shirts from the Chang Mai, Thailand, night market, as requested by the monk who took our RSVP. Knowing that we would literally use them for one day then ditch them, we didn’t want to spend too much. Frustrations grew as we could not find solid white anywhere and the few shirts with small logos (as bootleg as they may be) were all way overpriced. After a few near-purchases that fell through due to greed on the seller’s part, we finally found a pair of Polo shirts with only a the little polo player logo over the left breast. Naturally, upon arriving at the monastery the next morning at 7:30am, the monk told us that our shirts were no good because of the little logo, but no problem because he had ones we could use! Now you tell us! Oh well. We got dressed, ate a small breakfast and dropped our bags off in our teeny rooms. My domicile had only four walls and an open ceiling, a thin sleeping pad on the floor, a pillow and barely enough room to walk. Carrie’s was even smaller having an elevated metal bed with the same thin sleeping pad and less room to walk around. Our day began with an hour long intro to meditation by an older monk who seemed to have no patience for his job and didn’t let me ask a single question. The main idea behind the practice is to be consciously thinking of whatever you are doing and stating it to itself. Next, the monk taught us sitting meditation, which involves the practicer sitting cross legged with the back straight concentrating on breathing above all else. That was a very typical mind flow for me during sitting meditation…at least when I managed to stay awake. After our introduction, during which the monk confused me with tales of how meditation will change my life and make me calm and allow me to exist above my thoughts, we were told to go practice in our rooms. I had a pretty good time with the walking meditation, but as we had only gotten five hours of sleep the night before I didn’t last long while sitting. Also, my mind was filled with tons of questions that the monk did not have the time to answer, so “thinking” was a bit too common and I was worried that I wasn’t doing it right. After nearly two hours in my room, we all met again for lunch: the last meal of the day. It seems monks don’t eat after noon. Anyway, I went back to the office to see if I could talk to someone about all these questions and wound up sitting down with Carrie and a different monk who had far more patience and a great outlook on the whole meditation process. While meditation can, in fact, change my life, make me more calm and have all sorts of amazing benefits, it’s like riding a bike. You can’t just hop on and expect to race in the Tour de France. I was glad for this clarification, as lots of what Monk #1 said were things that I needed years of practice to attain…not things I should be fixating on during my first meditation session. It seems, however, that just sitting there trying hard to focus and spending most of the time saying “thinking” was, in fact, meditating. Much of the rest of the day was spent either meditating in our rooms or in the communal hall, complete with a Buddha statue, mats and a place for candles and incense. We also found time to break a few of the core rules of the retreat: no talking, reading or writing. To be fair, Carrie held out much better than I could and were she solo probably could have made it through the whole day. As for the reasoning behind the rules, we really began to understand it after breaking them. The whole idea behind meditation is to empty your mind and free it from external stimulants. Reading puts new thoughts in and writing makes you think about what you have already done. Fortunately, Wat Umong is very laid back on the enforcement of the rules as well as the schedule. We came and went as we pleased, though we did adhere to the no eating after noon and in bed by 9pm policies. The next morning we woke at 5:30am, an hour and a half after the scheduled time, did a little more meditation and headed for the bus terminal to get to Laos before our Thailand visas expired.